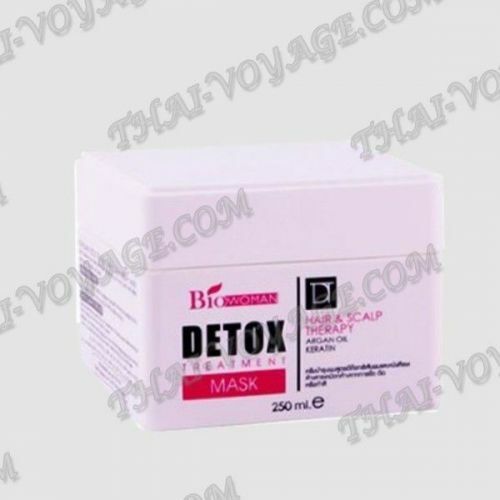 The ideal means to restore hair after coloring, perms, keratin straightening Mask BioWoman Detox Treatment intensely cleanses your hair from toxic chemicals using high quality bamboo charcoal. A new intense product for detox – a breakthrough in cosmetics for the care of damaged hair. Professional therapeutic, detoxifying hair mask with micro particles of bamboo charcoal are specially designed for hair care experiencing frequent chemical exposure such as perming, hair coloring, straightening, bleaching, etc. Mask detox incredibly effectively revitalizes hair follicles, deeply filling them with valuable vitamins and microelements, activating the regeneration of cell by stimulating the growth of strong and healthy hair. Contained in the mask Shea butter (Karite) has a unique nourishing, moisturizing, protecting and regenerating properties. High protective ability of Shea Butter makes it an indispensable tool for hair care. The most valuable properties of the extract of leaves of Camellia sinensis for hair care due to the presence of a huge number of biologically active substances: polyphenols, tannins, vitamins A, b, E,C, Coenzyme Q10, unsaturated fatty acids. Camellia sinensis contains natural Collagen, Antioxidants, therefore, this natural plant product is essential in the care of the hair, intensively penetrating into the hair follicle, perfectly strengthens and restores structure of hair after treatments coloring, straightening, perms, eliminates breakage and split ends, nourishes, relieves from dandruff and flaking, protects against environmental influences, perfectly maintains the Shine and luster of hair. Hair mask detox – chic and super effective means of the last generation to care for damaged hair formulated with high quality bamboo charcoal.